To describe Karajan's Hänsel und Gretel as the benchmark recording is almost to state the obvious. Its quality, both in terms of the performance and the recording, more than justify that status, and its perennial place in the catalogue may well explain why so few competitors have appeared in the intervening almost 60(!) years. Looking at the organisations and personalities that were involved in the original recording, it is hardly surprising that something of enduring was created. You've got Schwarzkopf at the height of her powers, the Philharmonia in a period when they were easily London's hottest orchestra. Karajan's legacy of operatic recordings is not unblemished, but there is no doubt that the best of it was the result collaborations with Walter Legge and the Philharmonia. Like their other great triumph, the 1956 Rosenkavalier, the Hänsel und Gretel seems to have been the result of some very relaxed recording sessions. Much of both operas were recorded in single takes, and there is a spontaneity here that live recordings today so often try, and so often fail, to emulate. Karajan had never conducted the work before, and there is an almost childlike curiosity to the way he teases details out of the orchestral textures. Mike Ashman, in his fascinating but brief liner notes, opines that Karajan goes for a more Straussian than Wagnerian sound, and that the musical focus is always on soloists in the orchestra, and on unmediated song, as opposed to aria, presentation from the singers. That's very true, but the balance between simplicity and sophistication in the singing of every major role is complex and fascinating. 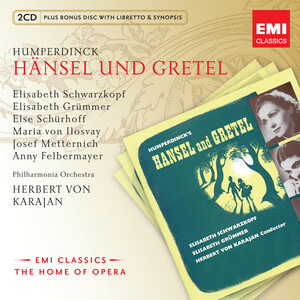 For example, Elisabeth Grümmer and Elisabeth Schwarzkopf, as Hansel and Gretel respectively, both sing with a child-like exuberance, and both bring endearing enthusiasm to the birdcalls and folksongs. But there is also plenty of vibrato in both voices, and there is never any suggestion that either is trying to sound child-like in their sound production. Else Schürhoff is great as the witch, but also very tasteful. It's a role you could ham up much more if you were going for the pantomime angle, although I'm not sure Karajan would approve. Much has been made over the years of the high quality of the recorded sound, and if you didn't know, you would be unlikely to guess that the recording was made in 1953, and in mono. The singers are extremely well served by the sound, as are most of the orchestral soloists. The tuttis often sound a little distant and muted, but there is a surprising clarity to all the orchestral textures. And what fabulous orchestral playing! There is real character to all of the wind and brass solos, and the ensemble in the strings is first rate. This reissue is not the only one on the market, nor is it the cheapest. EMI no longer have exclusive rights to the recording, meaning that anybody with access to the masters can issue it. There is a very reasonably priced version on Naxos, who have their own remastering team, so you can expect some slight differences in audio presentation. EMI, for their part, have come up with an interesting extra, the libretto as a pdf on a supplementary CD. Whether or not that will appease the many opera fans who regularly bemoan the lack of librettos in budget opera sets I can't say, but it is a nice touch. Of course, if you are already in front of a computer, finding the libretto on the internet is hardly difficult. Also, given the unused space on the CD, there would surely be room here to include the score as a pdf, and at no further expense considering that it too is out of copyright. A modern makeover, then, for an old favourite. EMI are at something of a turning point in their history just now, and if reissues like this can help to keep the company afloat, then they are certainly to be welcomed. Of course, the record industry has changed beyond all recognition since 1953, making the continual appearance of this recording in the catalogues one of its few enduring certainties. No doubt, EMI will continue to reissue it in various forms for as long as the company exists. If this did end up being their last version of it, then they've certainly done the recording justice with some handsome packaging. There is no doubt that it will continue to appear again and again as the years go by. The only question is, how long will the red square logo continue to appear in the top right-hand corner?